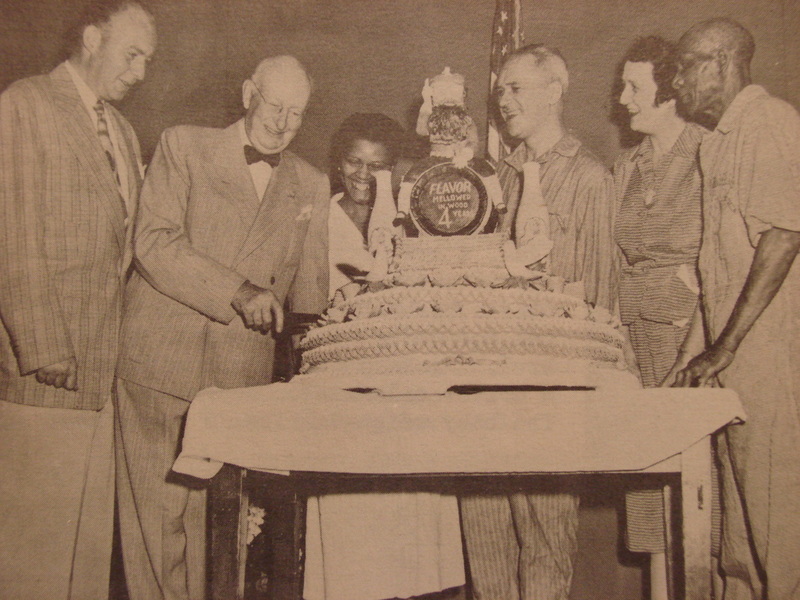 James Vernor III (left) watches as James Vernor II (second from left) cuts a birthday cake in 1951. Join us for the 150th Anniversary Party for Vernor's Ginger Ale in downtown Detroit. Vernor's is the oldest continuously produced soda pop in the United States. It's older than Coke, Pepsi, Hires, Faygo and everyone. Vernor's began in Detroit in 1866. ﻿Help us raise funds for a historical marker commemorating Vernor's history in Detroit! Help the Vernor's Club fund a Historical Marker in downtown Detroit to honor Vernor's Ginger Ale by going to our Go Fund Me page at: www.gofundme.com/f6mmxdrn . You'll also find a short video there about the history of Vernor's Ginger Ale. Thank you to everyone for an amazingly successful event! Thank you Detroit Historical Museum for hosting the event, promoting the event, having cool 150th Vernor's items made, bringing in extra staff, setting up the Vernor's exhibition, and much much more. The DHM staff is awesome! Thank you Dr Pepper Snapple Group for donating the Vernor's we sold to raise funds for the historical marker! Thank you for creating a new 150th logo for all us collectors to collect! Thank you, also, for the amazing work your staff members did during the celebration. Thank you James Vernor Family for being there. You traveled many hours to be part of the celebration and we appreciate it! Also, wow, what an amazing gift to the museum - the original 1800's recipe book handwritten by James Vernor I. Thank you Sander's Candy Company for donating 15 gallons of ice cream for the floats. Thank you Vernor's Club members! Your volunteer work behind the soda fountain helped us raise over $2500 toward the purchase of the Vernor's historic marker! When WAS Vernor's 150th Anniversary Party? This is now a list of what you missed. Vernor's week is June 5-11, 2016. There will be a special Vernor's exhibition all week at the Detroit Historical Museum. Several CVS stores downtown will have special Vernor's 150th Anniversary displays. The CVS at 350 East Warren will have a special chance to win custom Vernor's items! We've heard you can win a Vernor's bike, a stuffed Gnome doll, a 150th Anniversary hat and more. Check it out during Vernor's Week! There will be Vernor's floats, cream ales and Boston Coolers for sale at the museum on June 11th from 12:00 noon to 3:30 p.m. Proceeds will go toward the purchase of a historic marker to commemorate the oldest soda pop in America: Vernor's! Float sales are located in the Depot adjacent to the Streets of Detroit exhibit. We are lighting Detroit green and yellow for the Vernor's 150th Celebration! We will add buildings here that you should watch for a special nod to Vernor's. Most obvious will be the anniversary message on the huge Cobo Center marquee! ​The Detroit Opera House is also lighting up in green and yellow all of Vernor's Week! Watch their electronic message board for an anniversary salute. Friday, June 10, 2016: Ginger Beer Crawl by the Detroit Experience Factory - leaves at 5:30 p.m. from the Detroit Historical Museum. Tickets here. What events are happening on June 11, 2016? NOTE: The timing of some events has changed as of May 22nd. Detroit's Iconic Brands film - 11:00 a.m. to 12:30 p.m.
Chat with the film maker - Bill Kubota - 12:30 p.m.
Vernor's History Presentation - 1:30 p.m. to 2:30 p.m.
Vernor's Ginger Ale book signing by author - 2:30 p.m.
James Vernor and the Loyal Legion (Civil War Legion) - 2:45 p.m. to 3:15 p.m.
original James Vernor!) - 4:00 p.m.
World Record attempt (most pop drinkers) - 4:15 p.m.
​ Vernor's memorabilia for sale all day in the Museum Gift Shop. - Who is the real gnome? Be part of a 1940's Vernor's advertisement! ​The Poker Run is an event where you will receive a list of Vernor's sites to visit in Detroit. At each site, you take a selfie at the site (with the Vernor's item in the background) to receive a card at the museum. You win prizes based on how good the hand of poker is that you collected. The more sites you visit the better your chance to win a great prize. Get your ticket here. What restaurants are doing Vernor's Menu items June 5-11? Mudgie's - a ton of different Vernor's items! Keep checking back to this web site for more details on the party. We are adding restaurants now for menu participation. If you are a business owner in downtown Detroit and would like to participate, please email us at: vernorsclub@yahoo.com. Mutual Adoration, the folks that reclaim wood from Detroit homes being demolished and make handcrafted items, is offering a 15% discount during Vernor's Week. They're located at 6545 Saint Antoine Street, Detroit, MI 48202, just south of the Boulevard. Their hours are 11:00 a.m. to 5:00 p.m. M-F. Visit their web site here. Mention Vernor's 150th to get the discount. What? You don't carry Vernor's at your business, but you'd like to? Awesome! We can help you with that. Just contact Kim Eldridge, Business Development Manager covering Vernor's in Detroit. 313-475-0044. If you have Vernor's advertising or historical pieces and want them appraised, please email a photo along with the measurements of the piece. If you want to sell any Vernor's items, we have a quarterly newsletter and will be happy to list your item for Vernor's collectors to see. Contact us at: vernorsclub@yahoo.com. HOUR Detroit - no link, but buy a copy of the June edition for six pages on Vernors!